The designation Atlantic Ocean, originally given to the sea that lies beyond the great range of Atlas Mountains in North-western Africa, has come to be applied, with the extension of geographical knowledge, to the whole of that vast ocean which occupies the wide and deep trough that seperates the New World from the Old. Its limits were variously defined; some geographers regarded it as extending from pole to pole, while others consider it as bounded at its northern and southern extremities by the Arctic and Antarctic circles respectively. The decision by the International Hydrographic Organization in the spring of 2000 to delimit a fifth world ocean, the Southern Ocean, removed the portion of the Atlantic Ocean south of 60 degrees south latitude. The Atlantic Ocean is only slightly larger than half the size of the Pacific Ocean. The Atlantic Ocean lies between North and South America on the west and Europe and Africa on the east. Up north, the Atlantic connects to the Arctic Ocean and to the Southern Ocean to the south. 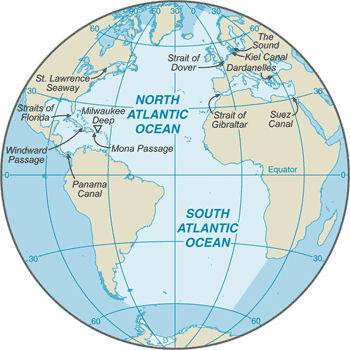 The Atlantic is often divided into two basins: the North Atlantic and the South Atlantic. The North Atlantic, where waters sink after being chilled by arctic temperatures, is the start of the “global ocean conveyor,” a circulation pattern that helps regulate Earth’s climate.